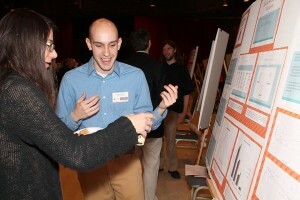 The annual Research Symposium draws students from each of the University's six colleges. The free public event will be held in two sessions, 9–11 a.m. and 1–3 p.m., at the Bone Student Center. Students from each of the University’s six academic colleges will set up posters in the Brown Ballroom and informally explain their studies and findings to anyone who stops by. Attention students: Use the hashtag #RedbirdScholar when sharing your research over social media. For some students, like junior Alexis Econie, a double major in organizational and leadership communication and sociology, presenting and doing research are new experiences. 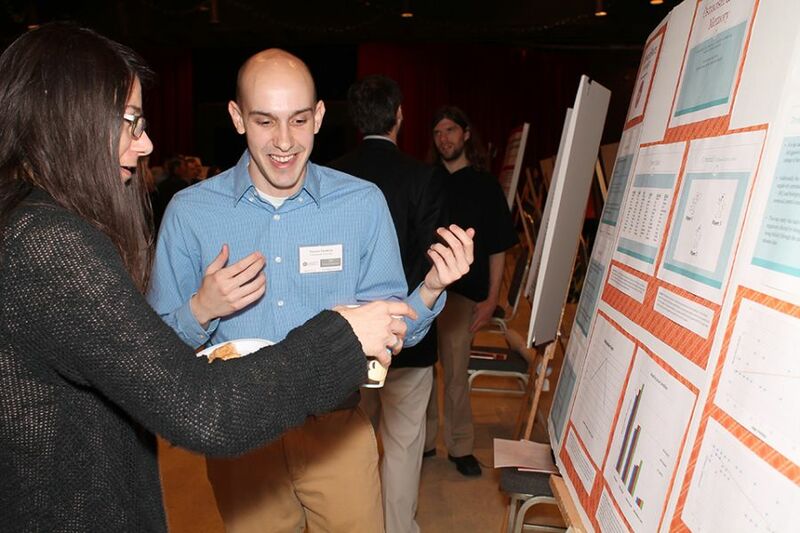 A Research Symposium presenter explains his research to an attendee at the 2015 event. The symposium will help prepare Econie for a National Science Foundation-sponsored summer internship at the University of Wisconsin during which she will present research at a conference. For her project, Econie studied the influence that the number of text messages college couples send each other had on the strength of their relationships. She found a link and noted that some couples send upward of 100 texts a day. She conducted the research as part of School of Communication Professor Aimee Miller-Ott’s Communication Research Methods class. Miller-Ott teaches these undergraduate students about the research process, including how to properly develop literature reviews and surveys. Many of the symposium participants are graduate students, like Taryn Butler, of the Department of Politics of Government. She is updating a 1993 study that examined the “rally around the flag effect,” which hypothesizes that U.S. presidents will see an immediate rise in their approval ratings when they authorize military force. Research is essential to her field, Butler said. Related Video: Magical thinking Student explores magical thinking for Research Symposium. Butler was assigned the research project in Professor T.Y. Wang’s Introduction to Research Methods course. Wang mentored Butler and her fellow students and challenged them to defend their findings during the process. He said the skills they learn in his class are important to their careers. For example, he has students who will work in government or enter Ph.D. programs where they will need to conduct research. And he has students who are part of the Stevenson Center’s applied community and economic development program and will need to write grants and analyze data for local communities. The symposium is a good challenge for the students, Wang said. They must clearly and concisely present their research on a single poster and communicate their findings and its implications to a general audience. “(The symposium) is a great opportunity to practice those skills,” he said. Oral presentations prepared by 16 students from the Department of Physics are set for 12:30 to 4:45 p.m. in 215 Moulton Hall. Panel presentation from the Department of Sociology and Anthropology is set for 1–2 p.m. in 396 Schroeder Hall. For more information about the University Research Symposium, call Kim Shennett of the Graduate School at (309) 438-2587. Illinois State Graduate School’s Kim Shennett contributed information to this story.